How many of you are looking for this question on internet that How to delete Facebook account, delete Twitter account, delete Google account etc. Deleting all you social media accounts or any other web account is not a easy task and most of the web sites don’t want you to close out your accounts with them. Now you will delete all your web accounts very easily with the help of JustDelete.me web site. 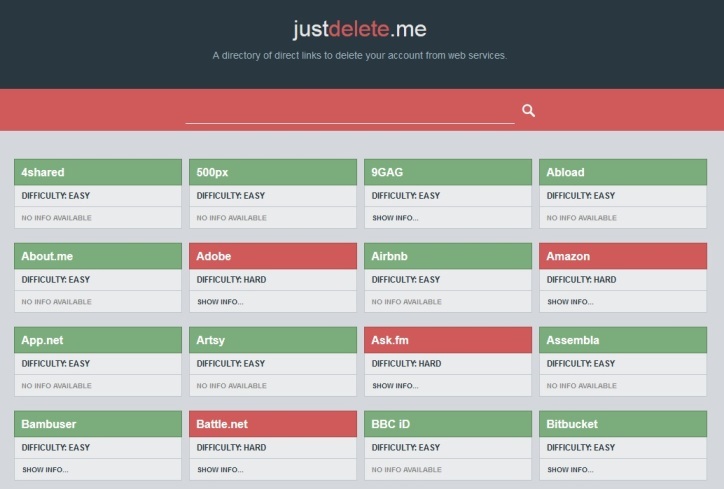 Basically JustDelete.me is list of web directory which provides you the full details to delete all your accounts with the links and information. This includes all the popular social media account site and other site like Facebook, Foursquare, Dropbox, Amazon, ebay, aboutme, Digg, Flickr, Feedly and lots more. The site doesn’t really help you delete your online account, it will provide you the details how to delete the account with the links. Most of the website didn’t provide you any details on how to deactivate or delete your account, here you can get all the details of the website which you are looking for with full information. Lets take a example, to delete your Instagram account. Visit the Justdelete.me website on your favorite browser and search for the Instagram web account form the website. On the Instagram tab you will see the option Easy and but didn’t see any info how to delete your account. That means Instagram didn’t provide any option to delete your account. But Justdelete.me will provide you the direct link of the Instagram support team to delete your account. Click on the Instagram Tab and you are redirected to the Instagram page, from here you have to send them a request to delete your account. Lets see one more example, to delete Whatsapp messenger account. Again search the Whatsapp tab from the justdelete.me site. On the Whatsapp tab you will see the information how to delete your account. Here you can see the full details what to do and what steps you have to follow to delete your account easily. With this way you find all the detail about how to delete your web site and social media account. So next time you want to delete any of your web account, visit JustDelete.me website and save your time and get the detailed information on how to delete web accounts.